1 - If you haven't watched this yet, please do. Dwija posted it first and I'm so glad she did. I've watched this over and over again since Tuesday. It's a bit silly and fun, and it's supposed to be because our Catholic faith is fun and we should be lighthearted! - but it makes me choke up every time I watch it. All I can think is that if I didn't believe in God I would want to because of the hope and promise in JPII's words. I fear that I'm inadequate to raise children who are capable of withstanding the assaults that are ahead. Can I truly raise martyrs? Am I even strong enough to be a martyr myself? Maybe not to death, but to jail? Or to joblessness? What will I be asked to sacrifice for my faith? And I'm sure some will read this and think I'm being melodramatic and that it can't possibly come to that. I hope you're right. But I believe you're wrong. It's already happening. 4 - THE REST OF THESE QUICK TAKES ARE NOT RELATED TO THE ELECTION! YIPPEE! 5 - Here's my latest post at Ignitum Today. It's a review of The Little Way of Advent: Meditations in the Spirit of St. Therese. If you're looking for a good book to help you keep Advent I recommend this one. I really liked it and look forward to slowly reading it and praying in a few weeks. 6 - My cousin Darcy sent this picture to me. I was really touched that she even thought of me and I wanted to share it, especially in light of my post "People at the Grocery Store Think I Have too Many Kids." 7 - We've recently started popping our popcorn on the stove. Occasionally I'll still use the air popper, but popcorn on the stove tastes so amazing that I don't know if I will ever crave microwave popcorn again. The oil flavors it so butter isn't even needed, just a little salt. You can find the recipe I use on my Pinterest board, Food I Gotta Make. I love what Kaitlin wrote. Since January (HHS) I've been saying that I really fear our children or grandchildren will be martyrs. #6 made me laugh because it reminded me of the cheesy intro to Sister Wives (the TLC show about a polygamist Mormon couple). The husband says "Love is meant to be multiplied, not divided." And if you think popcorn on the stove is good you should try it over a campfire! 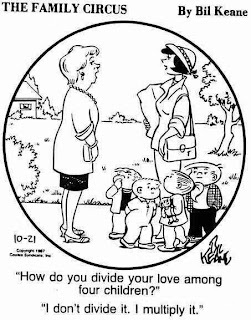 Well, clearly that Mormon man reads The Family Circus. How do you make it over a campfire except in one of those prepackaged things? There is a special campfire cast iron thing on a stick that has a lid. We've only ever used it for popcorn but maybe it's really for something else. Just like on the stove - heat a little oil in it, put in the kernels, hold it over the fire and let it pop! Add a little salt - so delicious. Well at first I was flattered to be mentioned on your quick takes (I pretty much live for your blog on Fridays) but then I was horrified that you eat popcorn without butter! We'll need to put this behind us if we want to continue our online friendship. That's too funny! I have to add butter when I use the air popper, which is why I prefer the stove. Plus it just tastes super good! Oh my goodness-you are totally forgiven because that video was amazing. Hannah and I are clapping and dancing around the kitchen listening to it! #2: Actually, I wouldn't have thought you were picking a fight at all - I have a a lot of friends who are feeling pretty beaten up by Tuesday's results and I've avoided politics on Facebook because of that reason. #3: Our hope should be in Jesus anyway, not in a political leader. Oh my goodness, Bonnie! Thank you so much for sharing that video. I hadn't seen it. Oh how I loved it! Thanks for your support earlier today, too! Glad we're in this together. My dad has been making popcorn on the stove (with this beat up saucepan) my whole life. Seriously...it's the best popcorn I've ever had in my life. It's the first thing I request when I go home. I played that video when you posted it on Facebook and Nathan came in to see what I was watching. I got home tonight from work and it was already up on my computer...he had watched it while I was out. And, I'm like you--I've already watched it a ton of times since you first posted it. Bonnie, I love the that video, too! Sister Helena shared it and I just loved it and scheduled it for next week, and now I can HT you as well :-) I wish I could come up with some great ideas for other speeches for him to autotune--he asked for suggestions on the Youtube link. 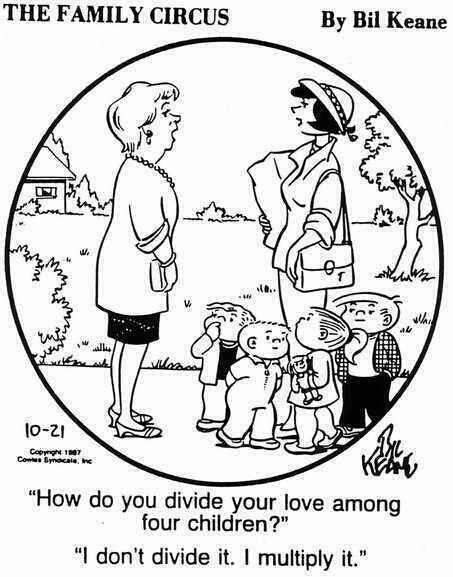 My mother in law, mother of 8 and grandmother/great grandmother of 30+, had that cartoon hanging on her refrigerator as long I knew her, more than 15 years.